In the wee hours of the night, soldiers from different NATO countries executed an integrated, synchronized, deterrence-oriented training exercise designed to improve interoperability and the combat readiness of the participating nations’ armed forces. Task Force War Eagle, which is comprised of German, Romanian, Slovakian and U.S. 2nd Cavalry Regiment soldiers, continued Exercise Dragoon Guardian as they utilized three temporary bridging capabilities to conduct a night river crossing over the Olt River in Valcea, Romania in support of Saber Guardian 17. This multinational training exercise that takes place in Bulgaria, Hungary and Romania is the largest exercise held in the Black Sea Region this summer. Saber Guardian 17 is an annual U.S. European Command, U.S. Army Europe-led exercise, which involves more than 25,000 service members from over 20 allied and partnered nations. The purpose of the exercise is to assure NATO Allies and partners of the U.S. commitment to promote regional stability and security, strengthen partner capabilities and fostering trust. Not only did the task force have to conduct a temporary bridging operation with limited visibility, but their combat arms soldiers had to engage an opposing force portrayed by Romanian soldiers to seize and maintain an objective before the task force could execute the river crossing. “Task Force War Eagle executed a contested river crossing mission last night,” said Lt. Col. Adam Lackey, commander for 1st Squadron, 2nd Cavalry Regiment. “Which meant that we had to fight across the river and against a determined ‘enemy’ who wanted to prevent our operations. The combined training opportunities that Saber Guardian provides greatly improves interoperability and highlights the flexibility of the ground forces, and enhances professional relationships among participating NATO allies and key regional partners. 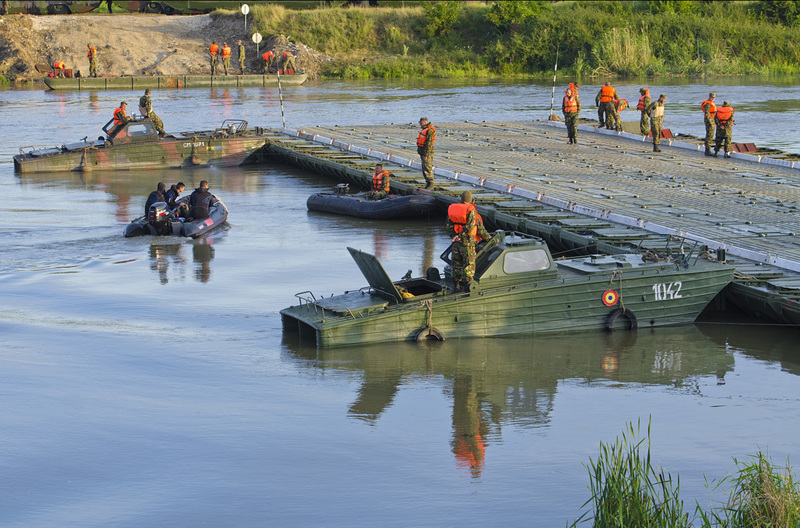 “The river crossing was important because it improved interoperability between several countries,” said Staff Sgt. Michael Vowell, weapons squad leader for Comanche Troop, 1st Squadron, 2nd Cavalry Regiment.